You have experienced each in your daily lives. Here are some examples. A. What kind of water do you use to wash your hands - hot water with soap, maybe? B. Is your ketchup the right thickness, and is it hard to get out of the bottle? C. Why does the door stop squeaking when you put on a few drops of 2-in-1 oil on the hinge? D. A clean, waxed car has bubbles of water after a rain, how come no bubbles when it was dirty? E. Have you ever noticed that a liter of wine is lighter than a liter of water? Each of these experiences is the result of a singular attribute of one of these five liquid properties. The science connected with each of these examples explains why they behave this way. Water and all liquids have a property called surface tension. This is a force that holds the molecules at the surface of a liquid together and keeps them from flying into space. Hot soapy water works better to wash your hands because the soap and higher water temperature lower the surface tension of the water and let the water mix with the dirt more easily to let it wash away. 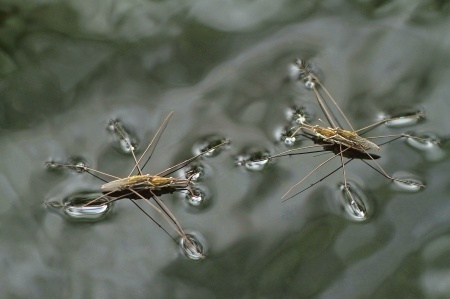 Also, surface tension is what allows bugs to walk on water. One way to think about ketchup is the thicker it is, the more it stands up on the hamburger or fries. If it’s thinner, it spreads out quickly or drips off the fries. There is a difference on how gravity pulls down on different brands of ketchup, with some spreading very quickly and easily (becoming drippy), and some not. This factor is related to the consistency of the liquid. When you turn on the faucet or tip over a glass water, the liquid moves around or flows. Pretty simple stuff, except for what is going on inside the water. The molecules of the water are moving past each other and causing friction. Some funny things happen when the molecules of any liquid do this. Sometimes, they will move smoothly, like with the oil that coats both sides of the door hinge. Other times, as with getting thick ketchup out of the bottle, you need to "wake-up" the ketchup to get it flowing out by smacking the bottle. This starts the molecules moving past each other. We call this crazy stuff viscosity. When you wax your car, you do this strange thing of lowering the surface energy of the hood, fender and the top. The water then crushes itself up and forms drops. A dirty car has high surface energy and pulls down or spreads out the water. This peculiar interaction is known as contact angle. What Determines that a Liter of Wine is Lighter than a Liter of Water? Depending on the mass of those pesky molecules and how closely they pack together, different liquids in the same size containers have different weights or densities. We hope that these cursory explanations of the nature of liquid characteristics provide a rudimentary understanding of and a curiosity about these five liquid properties: surface tension, consistency, viscosity, contact angle and density. The Second Question is, Who Cares? These snippets demonstrated how liquid properties touch your life. I am sure that many of you will respond with, "OK, but so what? Who cares?" For soap or detergent manufacturers, surface tension has serious implications. A laundry detergent must effectively remove dirt from clothing. To do this, the detergent must lower the surface tension of the water so it will effectively mix with the stains and foreign matter and wash these away. The ketchup, mustard or mayonnaise producer has two problems. The first is to measure what I call apparent thickness, or how well it flows, otherwise called consistency. A second problem relates to packaging. If a squeeze bottle is used to dispense the product, viscosity has a dramatic impact on how it flows from the bottle. The design of liquid processing plants, and the piping systems used to move the fluids around are constrained by viscosity. This is a liquid property that can mean success or not. Where the cleanliness of a surface is important, as in the production of silicon computers chips, a method is needed to test for cleanliness. The measurement of the contact angle of a water drop on the silicon directly correlates to this important detail. In the process of producing wine, fermentation changes the amount of sugar present. This alters the density of the wine and correlates to the progress of the wine's development. Density measurement is quick and easy. This is another example of the importance of the liquid characteristic of density. A producer of poster paint must provide for a range of surfaces. 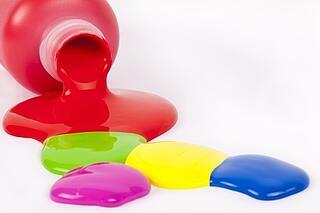 Various materials or substrates such as coated paper, plastics, and polymers each react differently with paint. To meet these different needs, several formulations of paint are essential. Each will have different characteristics of surface tension, viscosity, contact angle and density. The contact angle of a paint drop on each surface/substrate will be an indicator of how well the paint works, i.e. will it adhere, or tend to runoff? When you get that part of the formulation correct for a specific substrate, the resulting surface tension measurement, which is independent of the substate, is useful in setting up and controlling the production process for that formulation. This new product option may also have a different viscosity. Application systems such as spray nozzles may have to be modified for the different viscosity reactions. If it turns out that the density varies, the packaging and coverage specifications may need to be changed. These are but a few examples of the vast world where liquid characters are important elements in production and application for liquid-based products. Surface Tension - Tensiometers are used, which calculate the force needed to break through the liquid surface. Consistency - A pile of the sample is enclosed in a container of fixed volume. The container is opened and the time measured for gravity to pull the sample a fixed distance. This instrument is called a Consistometer. Viscosity - The measurement of the friction between the molecules in a flowing liquid is measured by an instrument class known as Viscometers. Contact Angle - Contact Angle Instruments measure the angle between a drop and the surface of the substrate. They are sometimes known as goniometers. Density - Density is measured by comparing the weight of a volume of the test sample with the weight of the same volume of a standard liquid. There are numerous variations, models and techniques used in each of these instrument types. Yes, the Measurement of Liquid Properties is Important. The following list of industries that depend on the measurement of one or more of these liquid properties illustrates their importance. I hope this harangue about the importance of liquid properties has been interesting, and has shown that liquid properties are not underwater real estate. Please share it with colleagues you think would enjoy it. P.S. Did you know that you can subscribe to these exposés, rants, raves and ramblings? All you have to do is enter your email address into the box just to the right of the title.